For centuries the powerful Kingdom of Kongo covered much of the territory now called the Democratic Republic of Congo. Portuguese explorers, in the 14th century, were impressed by its culture and effective government, and missionaries soon spread the Christian faith. European demand for the kingdom’s riches, however, including gold and slaves, weakened good relations and assaulted the population. In the 1880s, when European powers were dividing up Africa, King Leopold of Belgium seized the Congo as his own personal property, to exploit as he wished. The cruelty of his rule forced changes in administration early in the 20th century. Over the next 50 years the Belgian Congo saw considerable economic development; but oppressive colonial rule encouraged demands for independence. 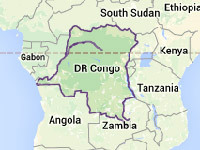 In1960 the Congo was granted independence from Belgium. The people, however, had not been educated or trained to take over the administration. Their huge country rapidly began to fall apart, and its natural wealth— diamonds, cobalt, rubber, copper, timber--drew the Congo into the Cold War rivalry between Western powers and the Communist bloc. Briefly the Congo had a good leader named Patrice Lumumba, the first democratically elected prime minister; but he was assassinated by followers of a war lord, Joseph Mobutu. . Under Mobutu’s dictatorship, from 1965 to 1997 the country (then called Zaire) was relatively stable. In 1997 a coup brought Laurent Kabila to power, and after his assassination, his son Joseph Kabila. The country’s name changed back to the Democratic Republic of the Congo, but for decades it has been devastated by fighting between the Congolese army and numerous rebel armies and militias from neighboring countries. Especially in the eastern region, the Congo is still in a state of continual unrest and warfare, affecting much of the Congolese population with every kind of abuse and deprivation.